Looking for a new electronic kit but not quite sure whether to take the plunge? Yamaha may be able to help thanks to their new try before you buy scheme. At the beginning of the month Yamaha launched the programme, which allows you to loan their top of the range DTX 900 series kits before committing to buying. 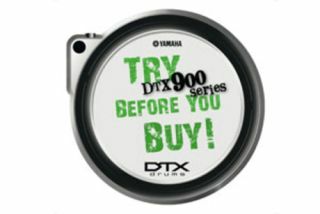 Gavin Thomas at Yamaha explains: "Try Before You Buy is a good opportunity for people who are considering the investment of high end electronic drum set but have not had the time to uncover what the DTX900 series can offer. This is a high value purchase and we want to support our customers by giving this opportunity without any obligation". For more information head to Yamaha's website.